When we were little, my parents would bring my siblings and I to an awesome playground in the next town over. It was called Kids' Cove, a massive wooden structure with tunnels, steps, slides, tires, bridges and little hiding spots. You couldn't drag us away until it was almost completely dark out. With summer already in full swing, I've been daydreaming about that playground, remembering all the fun we had playing hide-and-seek in the crawl spaces and pretending to be pirates spying land from the highest spires. I started wondering if kids these days still had cool playground in which to burn excess calories and let their imaginations run wild. Boy are there ever! Not only are people still building playgrounds that inspire rambunctious play, they're getting creative about the materials and design. Many are upcycled from creatively repurposed stuff that might otherwise have ended up in the landfill. 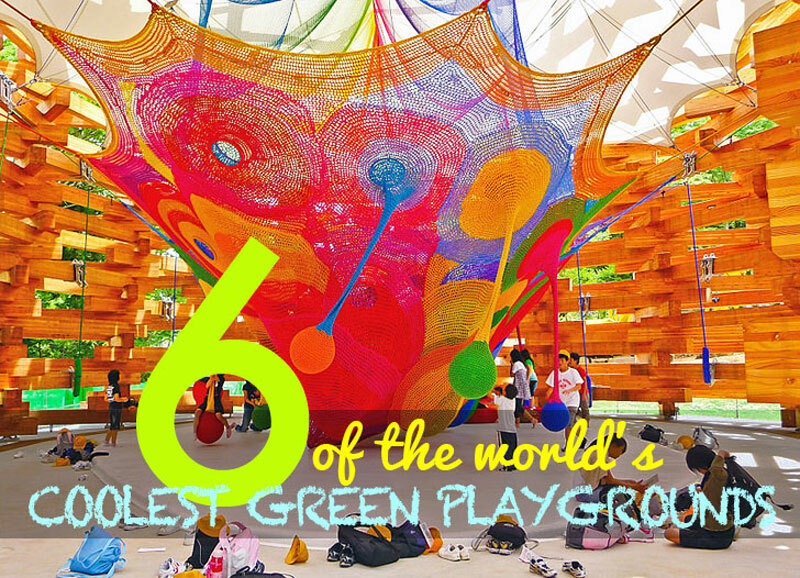 If you're looking for a family-friendly adventure this summer, seek out one or more of these awesome green playgrounds during your travels! NYC has a wastewater problem. If just an inch of rain falls across the city, it’s enough to overwhelm the sewer system, risking contamination of streets and waterways with overflow. As part of a green solution to this problem, the Department of Environmental Protection teamed up with the Trust for Public Land to create unique water run-off solutions inside 10 new playgrounds throughout the city. Instead of being covered in asphalt, the public play areas now feature “the latest in rainwater capturing tools, including barrels, raised gardens, porous pavement, and underground storage layers,” wrote Molly Cotter for Inhabitat. 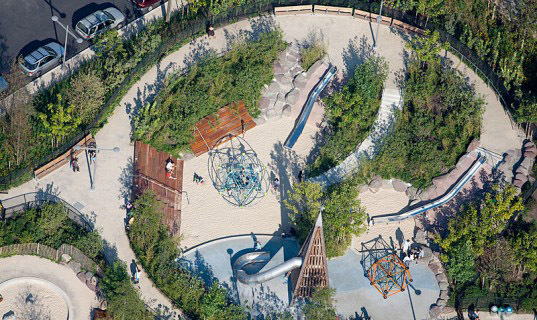 Look for the unique playgrounds in Newton Creek, Gowanus Canal, and Jamaica Bay. Much like the playground I remember from childhood, this wonderland built by Erect Architecture features a series of outdoor rooms, towers, and climbing structures. It’s set among the remains of a Victorian Arboretum, and as such, much of the park’s theme has to do with exploring and enjoying trees. The structures feature recycled doors, lots of untreated tree parts, and naturally placed boulders. It also “includes a vegetable garden, an orchard with fruit trees, and ‘mountains’ of steep escarpments adjacent to a safeguarded bonfire area,” writes Susan DeFreitas for EarthTechling. Everyone gets excited about a new wind turbine, but we rarely stop to think about what happens when one reaches the end of its life cycle. In the Netherlands, a country long-known for its ability to harness the wind, one creative firm decided that the blades and tower of a spent wind turbine deserved a better fate than the landfill. 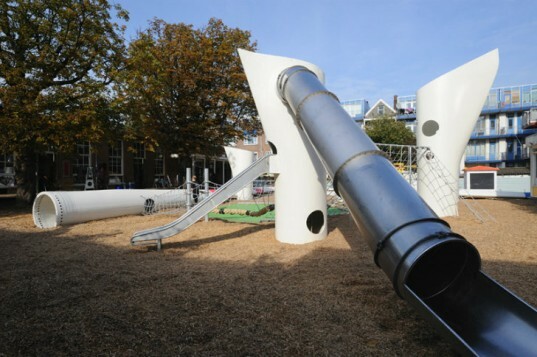 The Wikado playground, designed by Rotterdam-based architectural firm Superuse Studios, uses five discarded rotor blades to create a playground full of mazes, tunnels, towers and slides that just beg to be played on. People have a lot of energy-producing potential, if only we have access to technologies that will capture it. Global Inheritance is a non-profit organization that develops creative, cause-based campaigns to educate individuals about issues that affect us globally. 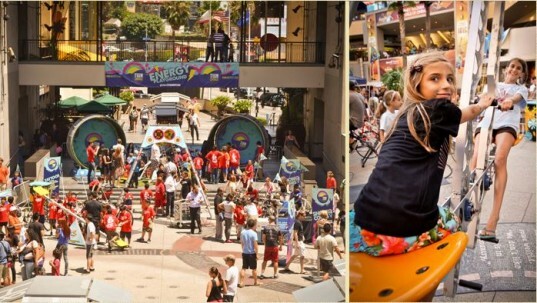 One of their specialties is the Energy Playground, a suite of futuristic playground equipment that creates free, clean energy for classrooms, music festivals, and other events. Look for their bikes, swings, seesaws, dance floors and human-sized hamster wheels at festivals like Coachella, Maker Faire, Voodoo Music Experience, and many more. 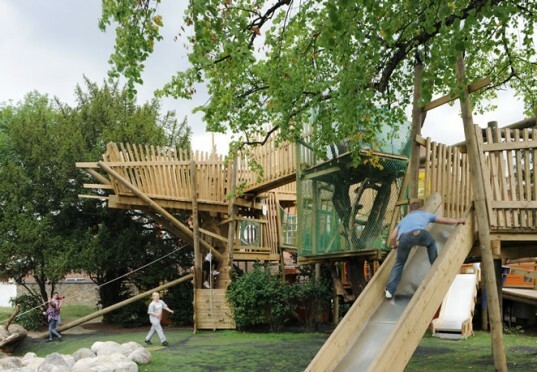 We’ve seen shipping containers upcycled into a lot of awesome things — but a playground? 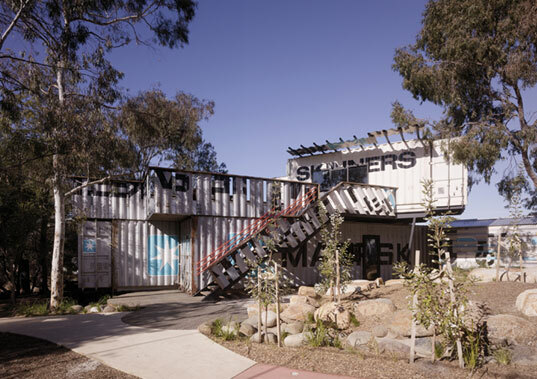 That’s just what Melbourne-based Phooey Architects was able to achieve using four discarded shipping containers as the basis of its design for a unique adventure playground and childhood activity space. “Many of the structural elements in the Skinners Playground are simply container cut outs that have been re-positioned. The stair railings, shade overhangs, and balconies are all parts of abandoned containers. The materials are left with tell tale signs of origin, giving a feeling similar to kid-constructed tree houses and forts from found objects,” reports Inhabitat. 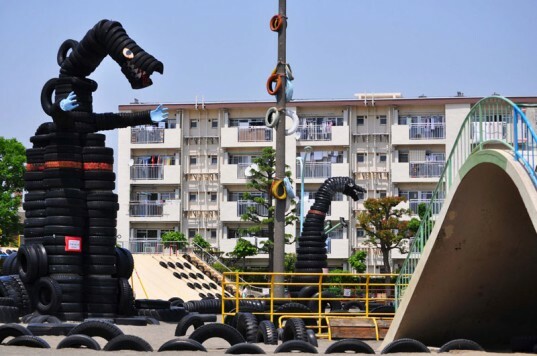 Located right near Japan’s Kawasaki plants, is it any wonder someone decided to build a playground from unwanted tires? Nishi Rokugo Park (which means Tire Park) features dinosaurs, monsters, bridges, slides, and swings — all made from thousands of vehicle tires. Plus, there are lots of loose tires that kids and parents can use to stack, roll, jump on and climb inside. NYC has a wastewater problem. If just an inch of rain falls across the city, it's enough to overwhelm the sewer system, risking contamination of streets and waterways with overflow. As part of a green solution to this problem, the Department of Environmental Protection teamed up with the Trust for Public Land to create unique water run-off solutions inside 10 new playgrounds throughout the city. Instead of being covered in asphalt, the public play areas now feature "the latest in rainwater capturing tools, including barrels, raised gardens, porous pavement, and underground storage layers," wrote Molly Cotter for Inhabitat. Look for the unique playgrounds in Newton Creek, Gowanus Canal, and Jamaica Bay. Much like the playground I remember from childhood, this wonderland built by Erect Architecture features a series of outdoor rooms, towers, and climbing structures. It's set among the remains of a Victorian Arboretum, and as such, much of the park's theme has to do with exploring and enjoying trees. The structures feature recycled doors, lots of untreated tree parts, and naturally placed boulders. It also "includes a vegetable garden, an orchard with fruit trees, and ‘mountains’ of steep escarpments adjacent to a safeguarded bonfire area," writes Susan DeFreitas for EarthTechling. We've seen shipping containers upcycled into a lot of awesome things -- but a playground? That's just what Melbourne-based Phooey Architects was able to achieve using four discarded shipping containers as the basis of its design for a unique adventure playground and childhood activity space. "Many of the structural elements in the Skinners Playground are simply container cut outs that have been re-positioned. The stair railings, shade overhangs, and balconies are all parts of abandoned containers. The materials are left with tell tale signs of origin, giving a feeling similar to kid-constructed tree houses and forts from found objects," reports Inhabitat. Located right near Japan's Kawasaki plants, is it any wonder someone decided to build a playground from unwanted tires? Nishi Rokugo Park (which means Tire Park) features dinosaurs, monsters, bridges, slides, and swings -- all made from thousands of vehicle tires. Plus, there are lots of loose tires that kids and parents can use to stack, roll, jump on and climb inside.